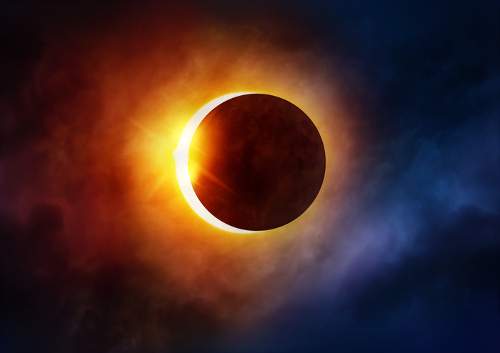 Home » General Health » Solar Eclipse 2017: Did Last Week’s Event Damage Your Eyes? Last week, millions of Americans got to experience a once- or twice-in-a-lifetime event—a full solar eclipse. Depending on where you live, for a few minutes, the moon moved directly in front of the sun, making the earth dark and cool, and providing a great photo op. If you weren’t looking through your camera, smartphone, or a set of eclipse safety glasses, you could have severely damaged your eyes. In most of the pictures that I saw, people were wearing protective lenses. But, every photo had a few who decided to ignore all the scientific evidence and advice leading up to the eclipse and stare directly at it—including the president. In fact, the day of the eclipse saw Google searches for “my eyes hurt” skyrocket to the top spots. If you viewed the eclipse through a special set of protective lenses (which were widely available prior to the eclipse), any camera display, or even looked up for a brief glance of less than a few seconds, you’ll be fine. Any pain or vision impairment you experienced likely subsided a few minutes later. Think of it as how your eyes would adjust to a bright headlight or a camera flash. On the other hand, if you looked at it for a few seconds or longer with your naked eye, through eyeglasses, or even through sunglasses, you’ve likely done some damage. And, let’s be real. If you looked up, it was more than just a glance—it would take your eyes a few seconds just to focus! It’s caused by exposure to the infrared lights that come from the sun. And even though you can’t see or feel them, they are there. Furthermore, the effects are cumulative. I heard about a lumberjack, for example, that suffered solar retinopathy because of all the time he spent looking up into the trees he cut down—with the bright sun in the backdrop! The reason why looking at the eclipse was safe through special eclipse glasses or a smartphone screen is because they blocked these harmful rays. Again, you may not experience symptoms immediately. But it doesn’t mean that they won’t turn up later. For instance, if you look at the sun or have exposure to UV rays, these symptoms may begin to appear. In most cases, however, the symptoms may subside, and regular vision can return in a few months to a year. Unfortunately, there is not much you can do to reverse or treat the damage. Eating or supplementing with the antioxidants lutein and zeaxanthin, for example, may be helpful in preventing or managing age-related macular degeneration (AMD) or other vision-related problems. But an acute experience like staring at the eclipse or daily sunshine has no natural treatments. Perhaps staying indoors or wearing sunglasses can make things easier. If you’re noticing problems with your vision, it’s recommended to get to an optometrist or ophthalmologist as soon as you can. Chen, K., et al., “Solar Retinopathy: Etiology, Diagnosis, and Treatment,” Retinal Physician, October 2013; http://www.retinalphysician.com/issues/2013/october-2013/solar-retinopathy-etiology,-diagnosis,-and-treatm, last accessed August 24, 2017. Hsu, A., “How To Tell If Watching The Eclipse Damaged Your Eyes,” NPR, August 21, 2017; http://www.npr.org/sections/health-shots/2017/08/21/545129631/how-to-tell-if-you-ve-damaged-your-eyes-watching-the-eclipse, last accessed August 23, 2017. Hauser, C., “Worried About Your Eyes After the Eclipse? Here’s What You Should Know,” The New York Times, August 22, 2017; https://www.nytimes.com/2017/08/22/science/eclipse-eyes-sun.html?_r=0, last accessed August 23, 2017.